Today, I'm happy to share with you an action and emotion-filled book that's set in Paris. 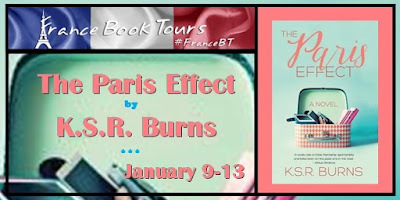 It's The Paris Effect by K.S.R. Burns. Amy, the main character of The Paris Effect, has so much going on, it's no wonder that she dreams of escaping to Paris. Her best friend has just died; she has lost her job; she obsesses about losing weight; her marriage is mostly numb. As her best friend went through rounds of chemotherapy, they came up with a plan, that they would take a trip to Paris. Over the years, they bought everything they needed, tucking them into specially purchased carry-on bags. When her friend died and her husband scheduled a 10-day business trip, Amy was suddenly presented with the possibility of that long-yearned-for trip. So she went. I loved seeing Paris through Amy's eyes. Because she was sick with a bad cold, she slowly comes aware in Paris, discovering the joys and the difficulties too. I come to a complete stop in front of the large display window, my jaw dropping. Tarts. Ruby raspberry, golden lemon, amber apricot, emerald kiwi, garnet plum -- as tempting as unguarded platters of jewels. And cakes. Tall triple-layered white vanilla cakes and brown chocolate cakes, showcased like favorite children on fluted white porcelain pedestals. Also light-as-air cream puffs. Flakey layered napoleons. Perfectly piped meringues. Precisely molded madeleines. Plain puff pastries in the shapes of pinwheels and hearts, glistening with sugar. I think you get the idea. Lots of details about the scrumptiousness of Paris. I guarantee that Amy had a trip to Paris like no one else's. As people offer to help her, from those she meets on the plane to those she connects with in cafes, everyone seems to have a slightly sinister agenda. The reader is never sure if Amy is too trusting. The novel definitely had high-tension and kept me reading quickly through to the end in just a day or so. I couldn't wait to find out what happened next. Make sure you scroll down to enter the giveaway for your copy of The Paris Effect. Friendship, loss and a tantalizing trip to Paris in this highly praised #1 Amazon Best Seller! Amy and Kat had planned a secret trip to Paris. Even Amy’s husband wouldn’t know about it. But when Amy loses Kat to cancer, she knows the plan is gone forever. Or is it? Guided by memories of her friend and dissatisfaction with her own calorie-counting life in Phoenix, Amy sneaks off to Paris while her husband is away on a business trip. Once there, she’s robbed, stalked, arrested and almost kidnapped. Worse, she finds that all her problems have come right along with her. Through her adventures, laced with luscious descriptions of food and Paris, Amy learns that often in life, love and friendship, nothing is exactly as it seems. Grab a croissant and settle in for a decidedly non-touristy trip to the City of Light. Roz, Yes, I can't believe you've never visited Paris. 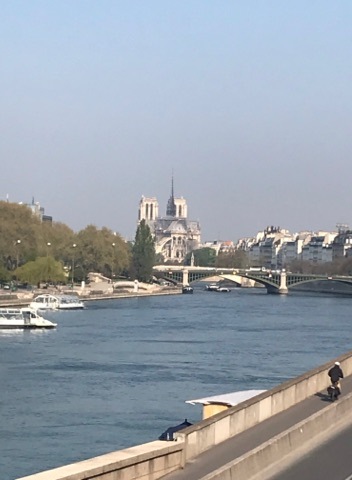 We do enjoy Paris, although that isn't our favorite part of France.